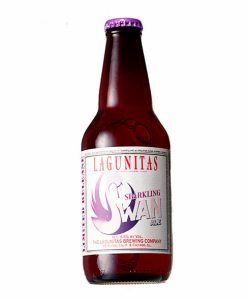 Mark begins with a Lagunitas beer called Sparkling Swan, made with Concord grapes and some wine grapes typical of Sonoma County, like Petit Syrah. This beer is slightly sour. The beer has purple-pinkish foam and is 6.5% alcohol. Jeremy’s title is Brewmaster. He shares that one of his colleagues changed that to Brewmonster. He says now he also does some marketing activity, such as today’s show. He loves those aspects of his job and he makes sure that some others can do the routine jobs of brewmaster.They also mention that Ron Lindenbush has acquired the site of the original Mendocino Brewing Company in Hopland. Red Tail Ale was born there. He has turned it into Hopland Tap which is open now. Steve asks for an update on Lagunitas. Jeremy says that their home base is always in Sonoma County but they have opened a brewery now in Chicago which is founder Tony Magee’s home town. Jeremy says it’s better to be in business with a brewer (i.e. Heineken) than a bank. Mark agrees it’s a good brewing company and compares it to Anchor, which is owned by Sapporo now but the beer is still made in San Francisco as always. Mark says Lagunitas with the big “IPA” on the label, really launched the style around the world more than any other brewer. Mark says this was a big risk that Tony took, before there was a real demand and he deserves credit for creating that demand. They describe how to make sour beer and how to prevent the souring microbes from getting into the other beer in the brewery. They also tasted the Lagunitas Mango beer. Jeremy finds it a little sweet. The full name is Mozango. The Moz comes from Mosaic hops and the “ango” part comes from Mango and they used the Z instead of the S because it just looks better. Steve asks about the Beer Circus, an annual Lagunitas event that Jeremy describes. It’s at the Petaluma Fairgrounds this year. It has grown so much that they can’t do it at the brewery anymore. It attracts about 5000 to 8000 people. There are side show acts and lots of good music. Jeremy says, “this is an attept at a very playful beer festival.” “Oh Hell yeah,” replies Steve.